With all the excitement of the race, I totally forgot to post photos of what the Black Metal V8olvo actually looked like by the time we had it all painted and bedecaled. Thing is, we didn't have time to apply the decals until we actually got the car to the racetrack. 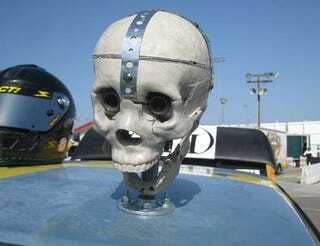 First of all, some commenters have wondered about the skulls mounted on the front edge of the car's roof. Those aren't just decorative skulls that just sit there. Hell, no! These are anatomically correct med-student skull replicas, and they're equipped with crowns of plumber's tape, Fiat indicator lights for eyes, and Dodge minivan vacuum motors operating the jaws! With high manifold vacuum (i.e., idling, cruising, decelerating), the vacuum motor pulls the skull's jaw shut; low manifold vacuum (i.e., gas pedal mashed to the floor) allows springs to pull the jaw open. I'll write up the fascinating details of how to build such important racing accessories for yourself, but for now let's check out the nice "before getting beat to hell" photos of the car. We masked off the original Volvo blue paint for the vaguely Boss 302-influenced stripes and shot the rest of the car with black rattle-can paint. Thanks to AFX Digital, we got some nice decals for the car, including these BØSS 3Ö2 emblems. The car came with "Happiness Is A Scruffy Dog" license plate frames (front and rear), so we decided to keep the front one on the bumper. And here's the car in action. I'll post a gallery of the Black Metal V8olvo in all its battle-scarred glory soon, very soon. That car brushed off some ludicrously hard hits that would have put flimsier machines out of the race for good, and it shows it.